I was slightly worried about my first gumdo lesson mainly because I’m six-foot six and the dojang ceiling is not high. I was worried that first, my sword would gouge chucks out of the ceiling and second, that having to lower my stances would make my legs ache. The leg ache lasted a few days and now, several months down the line, I’ve only brushed the ceiling with a sword tip twice. The biggest problem, and it is one that still persists, are the aches from muscles in the wrist and around the elbow joint. However, the aches haven’t been severe enough for me to cancel or change my training routine. The wrist ache is on the little finger side and is caused by letting the blade swing to far out and then, when your arms stop your wrists take the strain. Despite constantly working on the problem, by controlling the arc of the blade with the arms and the wrists locked in place, the ache hasn’t entirely gone and I’m sure some pain is caused by having to extensively rotate wrists especially for upward slashes. I initially remembered finding some positions quite unnatural and uncomfortable but over time the body adapts. For a good six weeks I had quite sore arms around the elbow joint most especially around the brachioradialis muscle. The ache is greater in the right arm is definitely caused by the constant practice of drawing the sword and re-sheathing it. Both the movements involve extending the sword so that most of the strain is on the elbow joint. I’ve been using a fairly heavy mok-geom (목검) which increases the workload on the muscles. I’ve since noticed the muscles in that area are taut and perhaps even slightly increased in size. But even two months later there is still some residual ache. The basic cut technique that caused the most problems was a horizontal slash at waist height (평베기 – pyeong-begi)). Not only is the wrist problem caused by the technique, but my sword didn’t travel on a level plane and when it passed the point of cutting, would rise upwards. I started to cure this bad habit by slashing along a piece of string I’d set up at waist height and focusing on the movement of the arms more like that of a punch. 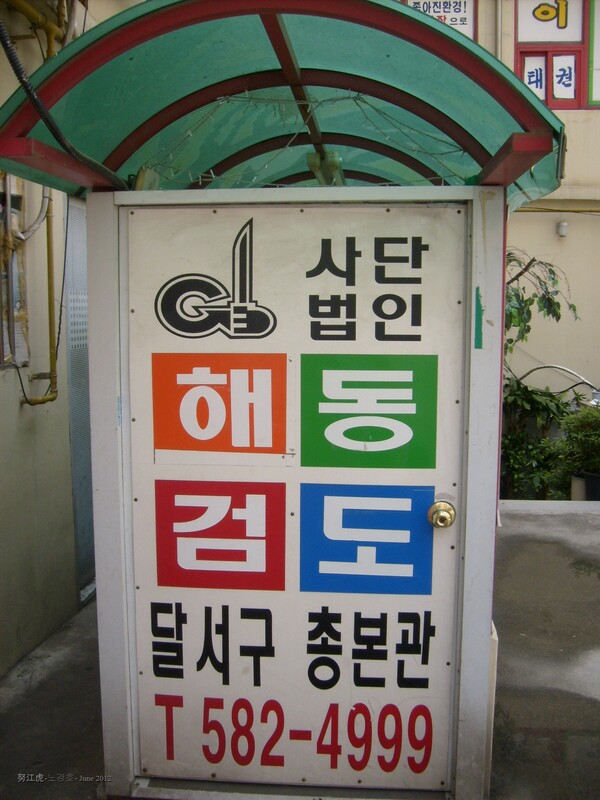 I currently live in Daegu, I am looking for Haidong Gumdo school. Where is the school you are studying at located? I am next to the Daegu Airport and I hope to find somewhere close to train at, since I do not have a car. My email address is Laronc77@hotmail.com, thanks for any help you can provided me. 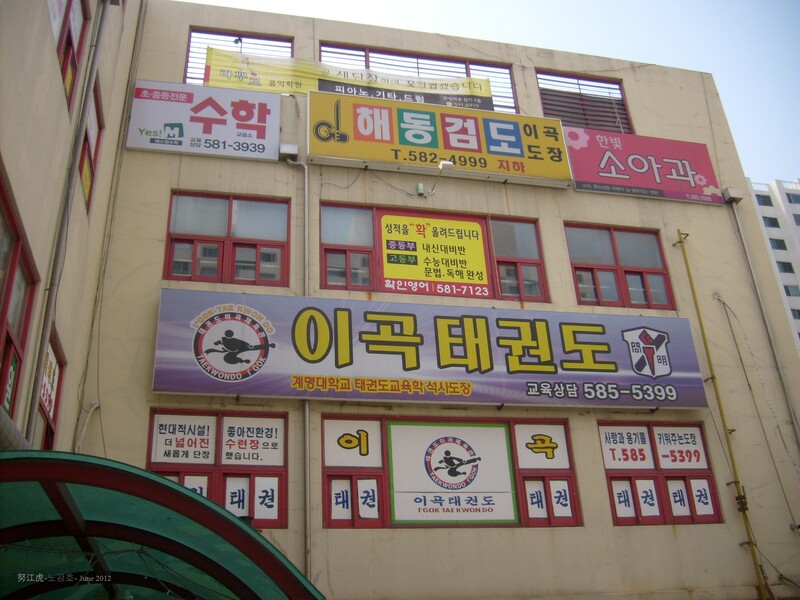 My school is in Song-so area of Daegu about 10 minutes walk from Song-so Industrial complex Subway station. You will definitely find a school closer than this. I will ask my instructor and then send you an e-mail.